ADAPA is the first standards-based, real-time predictive decisioning engine available on the market and the first scoring engine accessible on the Amazon Cloud as a service. ADAPA on the Cloud combines the benefits of Software as a Service (SaaS), the scalability of cloud computing and the extensive feature set of ADAPA on Site. What do you mean by standards-based? 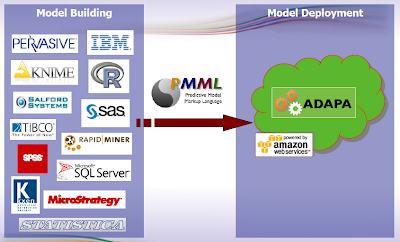 ADAPA executes predictive models represented in PMML (Predictive Model Markup Language). PMML is the standard for representing predictive models currently exported from all major commercial and open-source data mining tools. If you'd like to use ADAPA on the Cloud, but do not want to bother with PMML, contact us. We'll be happy to help you so that you start benefiting from ADAPA right away. ADAPA is very fast. We recently published a study on the ACM SIGKDD Newsletter in which we show that ADAPA can easily score thousands of transactions per second. In the High-CPU Extra-Large instance, ADAPA can score 300 million transactions per hour. FAST! What kind of models does it support? How about data pre- and post-processing? ADAPA transforms your raw data into meaningful feature detectors before scoring it. It post-processes the output of your predictive model so that it conforms to your requirements. ADAPA supports all the PMML built-in functions and data manipulations (as well as user defined functions). To learn more about how to represent pre- and post-processing operations in PMML, please take a look at our PMML data manipulation primer or simply contact us. Can I combine predictive analytics with business rules? 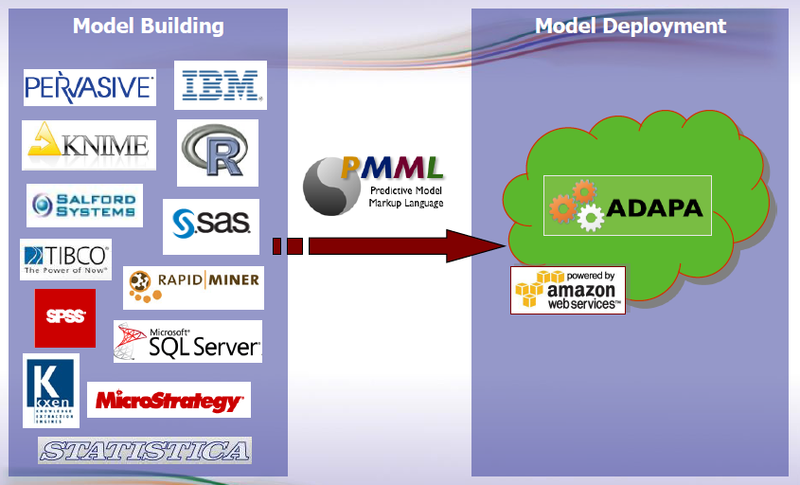 ADAPA provides seamless integration of predictive analytics and rules. Simply put, ADAPA allows data driven insight and expert knowledge to be combined into a single and powerful decision strategy. That is because in addition of a sophisticated predictive analytics engine, ADAPA also incorporates the full functionality of a rules engine. How do I pay for it? Is it expensive? Once you sign up for ADAPA on the Cloud through Amazon.com, ADAPA charges show up on your credit card bill. Amazon handles all the billing. You can even use the same account you use to buy books. ADAPA on the Cloud does not cost an arm and a leg. Check out our pricing! And, the best part, you pay only for what you actually use. I'll bookmark your site and think about this service. Thanks. Welcome to the World of Predictive Analytics! © Predictive Analytics by Zementis, Inc. - All Rights Reserved. Copyright © 2009 Zementis Incorporated. All rights reserved. PMML in Action: 2nd edition is out!